"Teaching NEW shooters how to be safe, and shoot straight"
Cost: Free for members and non-shooters. $5.00 for non-member children and shooters, up to $10.00 per family. Sponsored by Pinto's Gun Shop, Renton Fish and Game Club is pleased to host a number of Kids' Days at the range. Kids' Days are designed to introduce young shooters to the sport of marksmanship and instill a sense of respect and responsibility toward firearms. Our members volunteer their time, firearms, and ammunition to help teach basic firearm safety and marksmanship skills to young shooters. 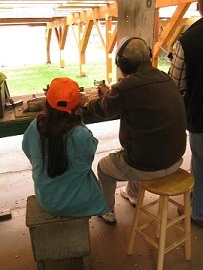 Although there are range safety officers and volunteers on hand, parental supervision and involvement is required. Safety first. Everything else is second. We provide a varying selection of rifles chambered in .22 Long Rifle. This small and inexpensive cartridge has very little recoil and is well suited for younger shooters. We also have a wide selection of targets for them to engage, including steel silhouettes, cans, clays, and other reactive targets. The more experienced shooters may choose to shoot targets all the way out to 200 yards. Occasionally, there may be a small centerfire rifle available for the older kids to shoot as well. Plan on joining us for lunch at Tiffany's BBQ Grill. Hamburgers, hot dogs, chips, and pop will be available for purchase. All proceeds go towards future Kids Day events. Pinto's Gun Shop has donated a beautiful NEW .22 Rimfire Rifle. Each shooter will receive 1 raffle ticket. Raffle to be held at high noon September 23. Each shooter will also receive 1 box of .22 ammo per day compliments of Diana Pinto. 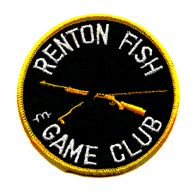 Santa Claus is coming to Renton Fish and Game Club on Sunday, December 9, 2018 from 10am - 1pm. Santa will participate in a special Kids' Christmas .22 Fun shoot then talk Christmas with the kids.